First, a little background on what we're going to be creating. For this tutorial series, I decided to create a tribute illustration to one of my favorite animated movies, Wizards by Ralph Bakshi. I chose to illustrate the iconic poster from the movie, featuring the character Peace. I thought a rendering of my own stylistic approach to an existing piece of artwork would be a great vehicle for a tutorial, because the foundation has already been set, and we can focus instead on the technique. 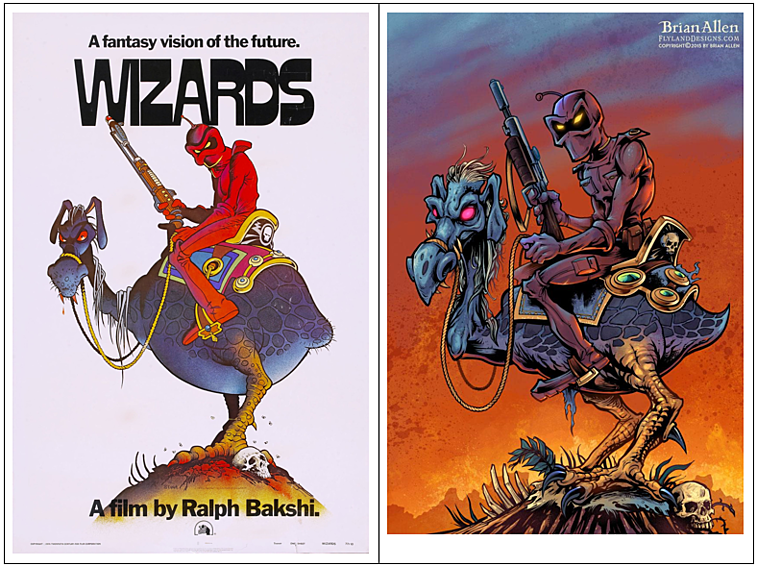 Ralph Baksi’s original classic poster art. Tribute illustration we will be creating in this tutorial. First, lower opacity on blue line pencils layer so you can just barely see it. Next, change resolution of document to 600 dpi. This makes linework sharper and more expressive. Lastly, change shortcuts so you can quickly access your inking tools. I like to have a shortcut on my mouse reel so I can quickly change between my two favorite inking brushes - one for outlines, and one for details. Create a new practice layer. Begin by setting aside 15 minutes or so where you start inking different parts of the illustration and experimenting with different brushes and strokes. This layer will eventually be deleted when it’s time to begin. Having a practice layer can take a lot of pressure off you in the beginning, and really helps you to loosen up before diving in. First, start with outlines and keylines. Make sure to avoid focusing on rendering or detail in the beginning, just outline the outside of all the basic shapes and forms. Fill in large areas of black first, this will save time by filling the piece quickly and preventing you from mistakenly rendering things that are in deep shadow. It will also help to build forms quickly and your piece will be balanced with an appealing contrast from the foundation. Next, remember to use the curve tool, elliptical rulers, and perspective rulers when necessary. This would typically be in situations when you'd traditionally use a ruler, french curve, or other stencil tool when drawing on paper. Be sure not to try to force it freehand, you've got nothing to prove! Finally, avoid zooming in too close. I generally try not to zoom in more than 50% of the illustration, or 1.5 to 2X the actual size of the printed illustration. Doing this will waste time and you might be in danger of muddying up the illustration with details that are too closely packed together. When high rendering with color, use fewer, thinner lines if you plan on doing a lot of rendering and shading in the coloring stage. Be sure to allow space for them to be seen and let the lines suggest and outline the form only. This method is usually better for cartoonish work. Conversely, when high rendering with ink, use more, thicker detailed lines if you plan on letting the inks do the work of rendering. 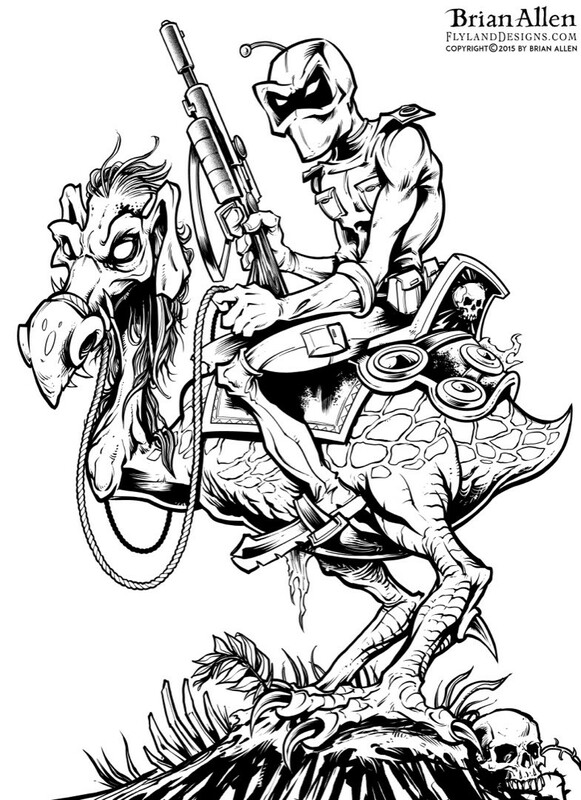 This saves a lot of time in the coloring stage and it's a great method for t-shirt and comic book artwork. First, remember to create quick strokes to give them life and avoid a shaky hand. This can be achieved by moving your arm at the elbow like a seismograph drawing lines on paper. Next, push and pull the lines in the direction that hugs the form, imagine the ink lines flowing around the form. Using stippling and/or textured brushes sparingly will add life and variation to the artwork. Lastly, when you are about 75% done, turn off pencil layer once the key lines are drawn. This allows you to see the piece anew, without the pencil layer. You will discover mistakes at this point, and find areas that need more rendering. If you wait until the end to turn this layer off, it may interfere with your overall contrast of the piece. That's it for inking, be sure to stay tuned for Part III - Coloring. I'll show you, step by step how to work through the final coloring process. For more creative inspo be sure to follow Brian on Facebook, Instagram and YouTube! © Copyright 2018 Smith Micro Software, Inc. All Rights Reserved.